When Anna suggested spicing up our kitchens, this project immediately came to mind. Inspired by this, I had made one for myself a while back and hadn’t gotten around to blogging about it. After months of use, I can say it’s a hit at our house. 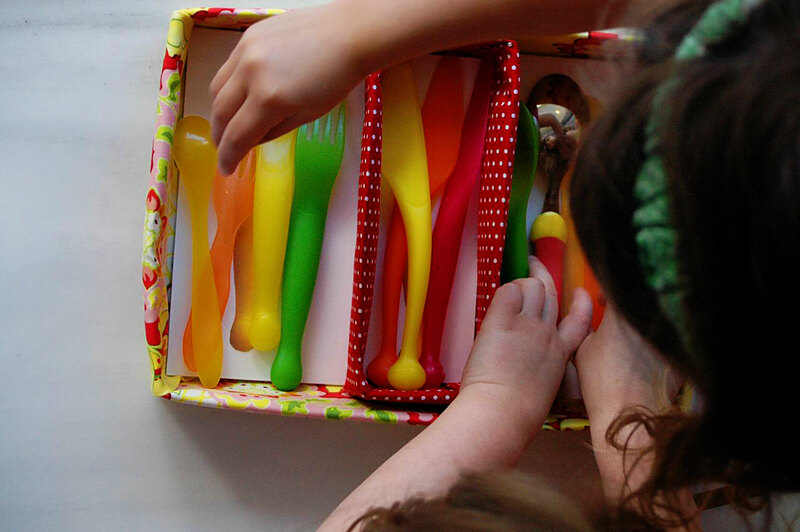 The jumble of spoons, forks and knives gave me a headache every time I opened the drawer, and now K can help put her cutlery away and knows exactly where to go to find what she needs. Now that everything is organized, she seems to feel less compelled to dump everything out of the drawer once or twice a day– I’m appreciating that, too. Because then I have to decide exactly how dirty I think the kitchen floor is at that moment and whether I feel the need to wash alllll of it again. Or just throw it all back in the drawer and call it an exercise in immunity-building. – the fabrics can be as plain or as exciting as you like. 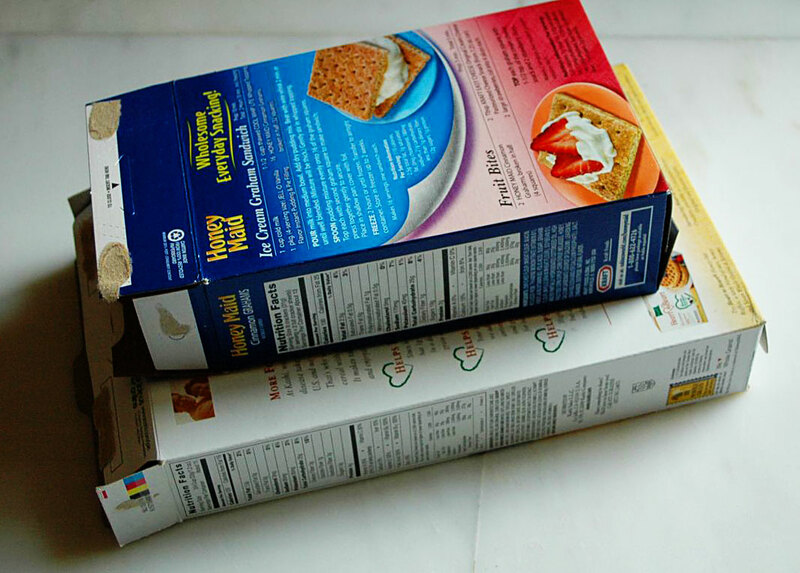 You’ll want to choose one cereal box that will be the main tray, and a smaller box that fits inside of it to section it. Make sure the larger box fits in the drawer you want to use and is also large enough for the cutlery to fit inside with some wiggle room. I cut my insert piece like so. 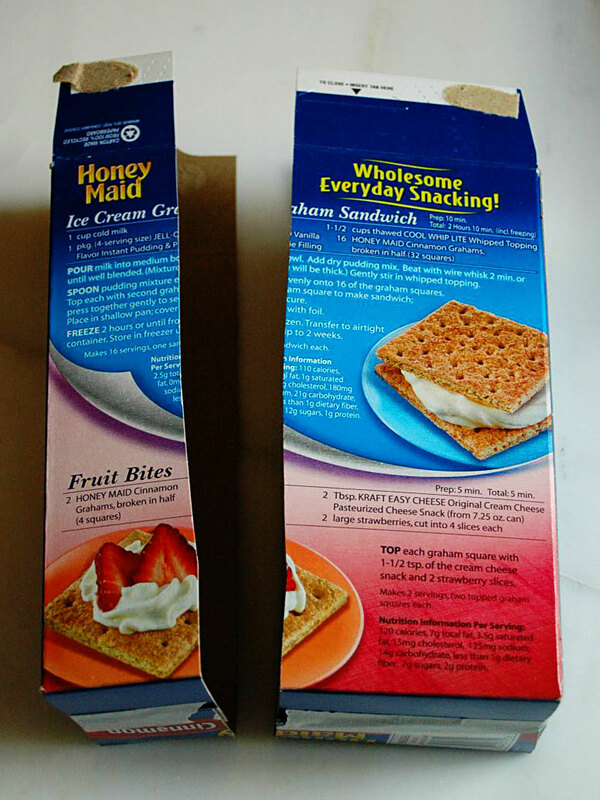 Cut away one face of the larger box and use tape to reinforce the edges. 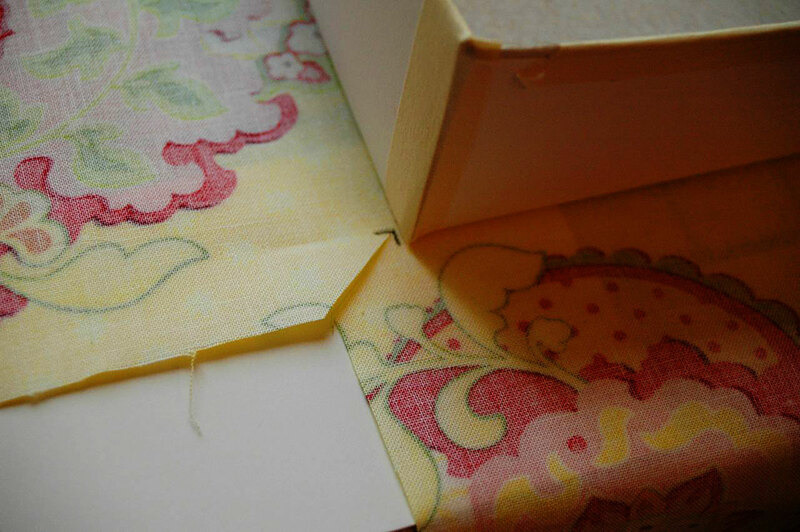 Trim the edges of the cut-away face so that you can use it to line the box later on. 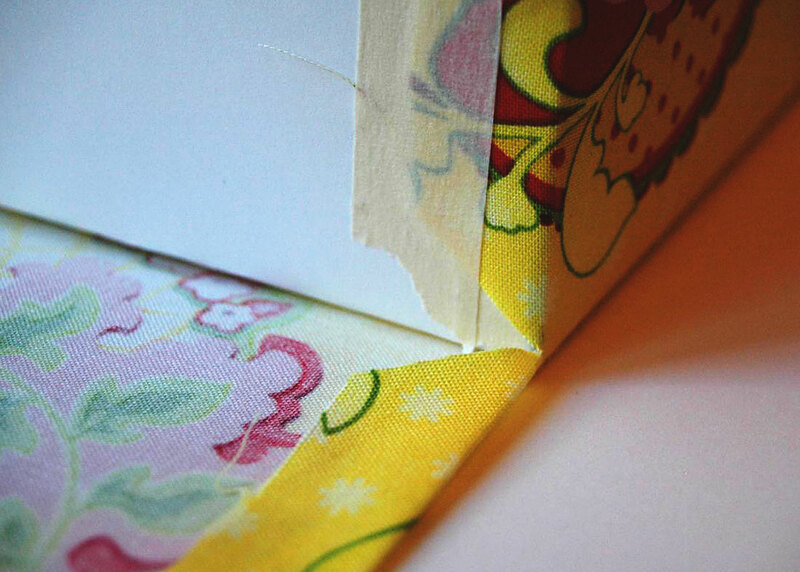 Cut a similar liner for the insert. 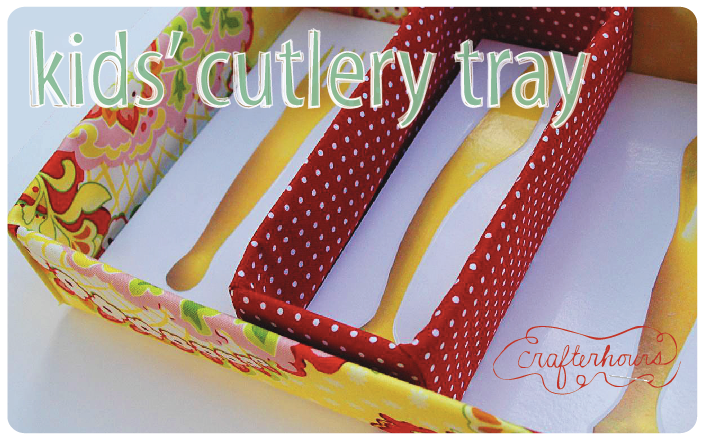 The next step is to cover the oustide of your trays and it serves two purposes. It provides a white background to go underneath your fabric so that you won’t see packaging through it, and it adds sturdiness to the trays. I used white bristol board; you can also use card stock or poster board. Tape around all of the edges. 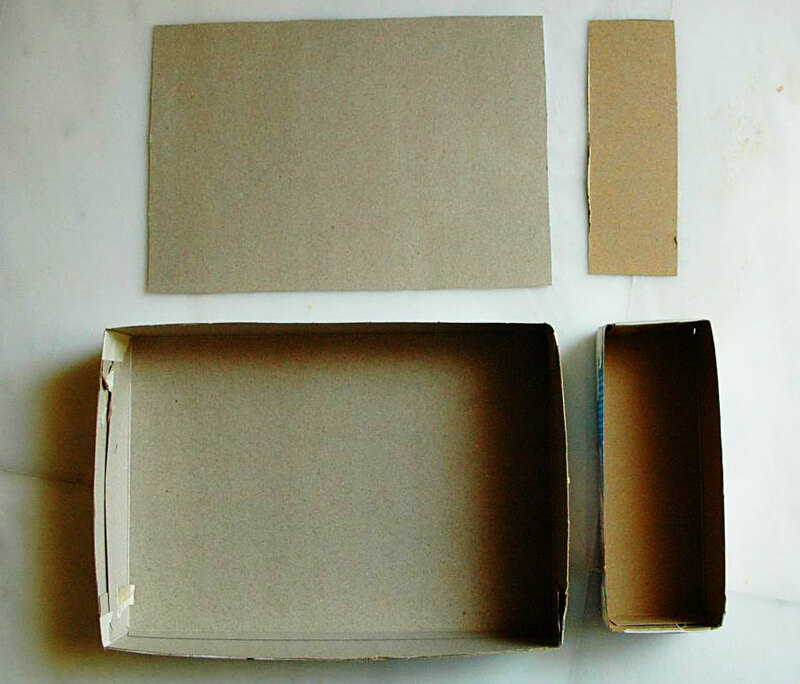 If you feel like your cardboard is already plenty sturdy, you could use a light coat of white spray paint. 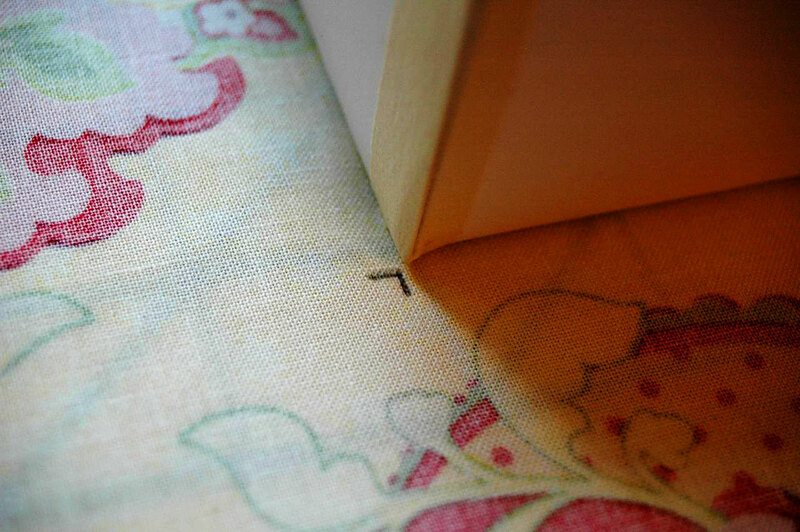 Lay your tray onto a piece of fabric and mark the corners. 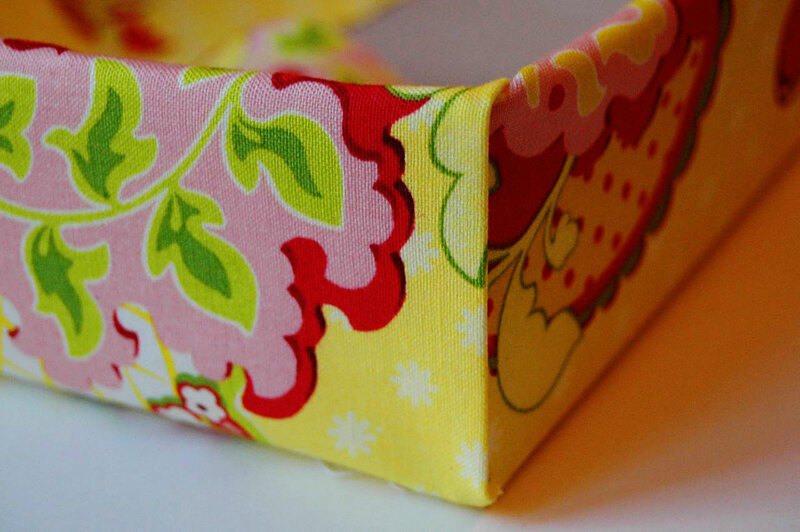 Trim the excess fabric from the corners, leaving enough of an edge to tape and/or fold. Like so. 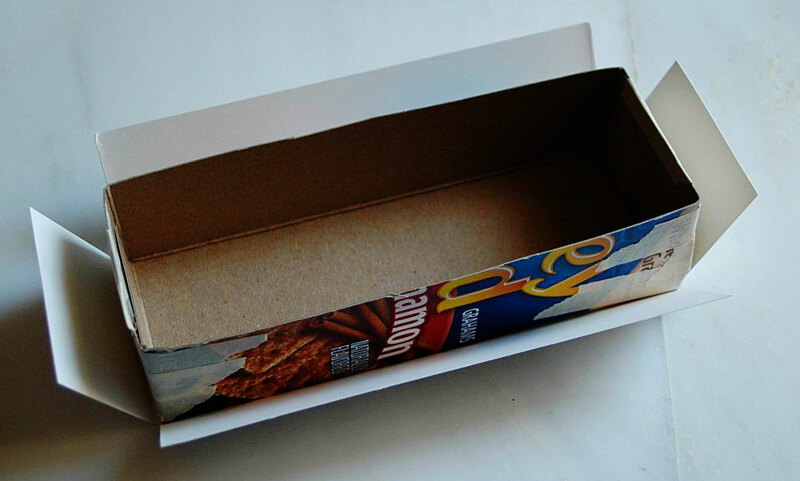 Trim and tape to the bottom of the box. Repeat all the way around. And do the same thing for the smaller tray. 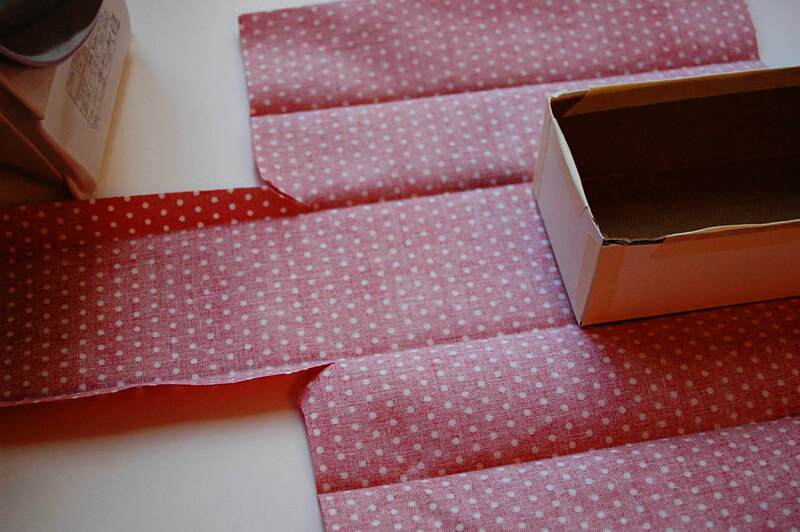 By placing the tray on the fabric and ironing the lines to follow, it’s not hard to line it up nicely. Pinky swear. At this point the boxes are wrapped in fabric, so we move to the liners. 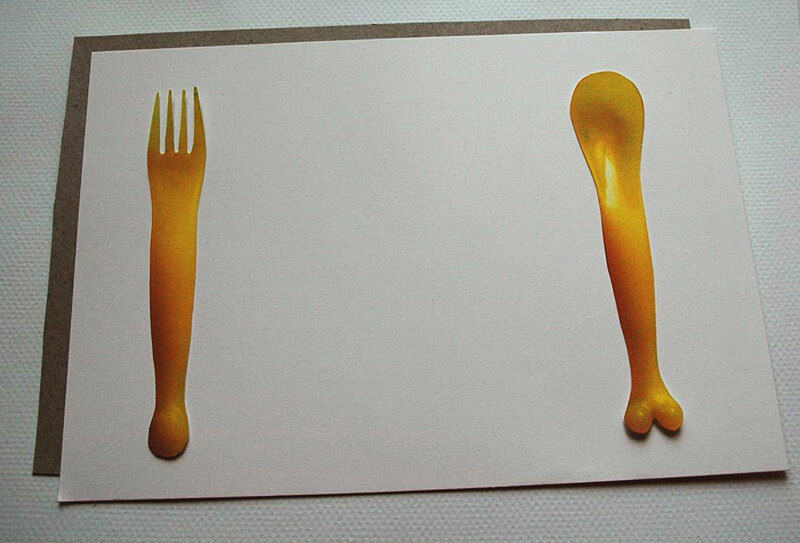 I took a photo of a set of K’s cutlery on a light background so that I could print them at about actual size. 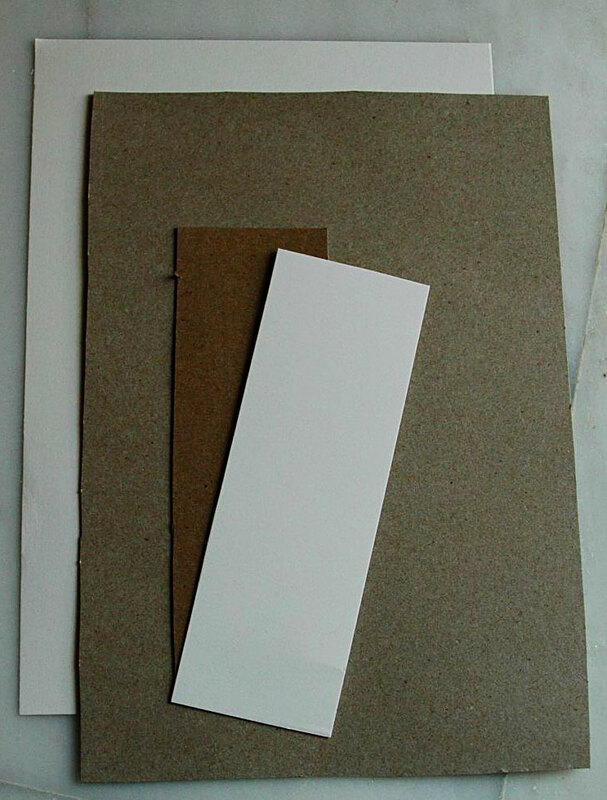 Alternately you could go low-tech and trace around a knife, fork and spoon on cute scrap paper. Or freehand it. Endless wild and crazy possibilities. Trim bristol board to match the size of the liners. 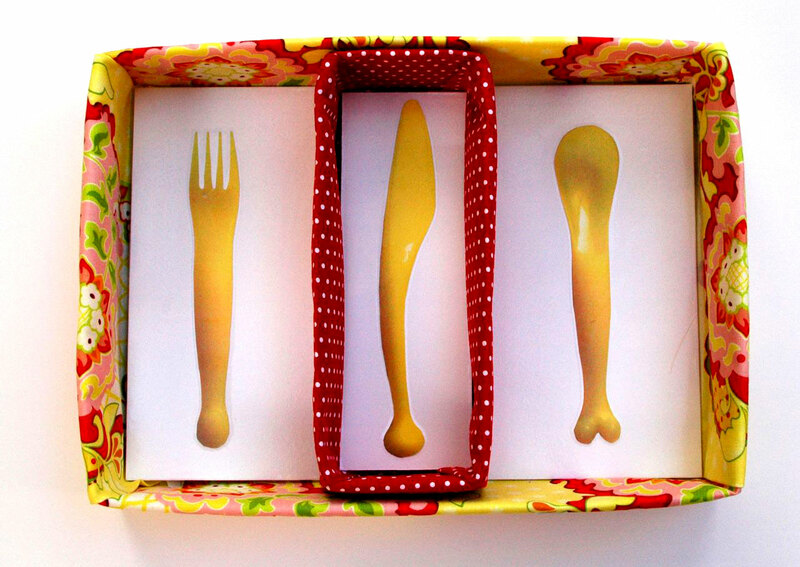 Cut the printed cutlery out and apply with a dab of glue stick. Laminate with clear contact paper. I used the insert tray for knives, since we don’t have or use as many, and that leaves the fork and spoon areas flexible. We have more spoons than anything else. Then let your 3 3/4 year-old and a bestie try it out. Works just as will with two. All done. Well, these are the pieces that were clean and coordinated. We must coordinate. At least for blogging. so so cute! I’m totally going to make one. Thanks again ladies. Where do you come up with these wonderful ideas?!!? Love this! Im making one as soon as the kids go to beds tonite. What brand of cutlery is that? 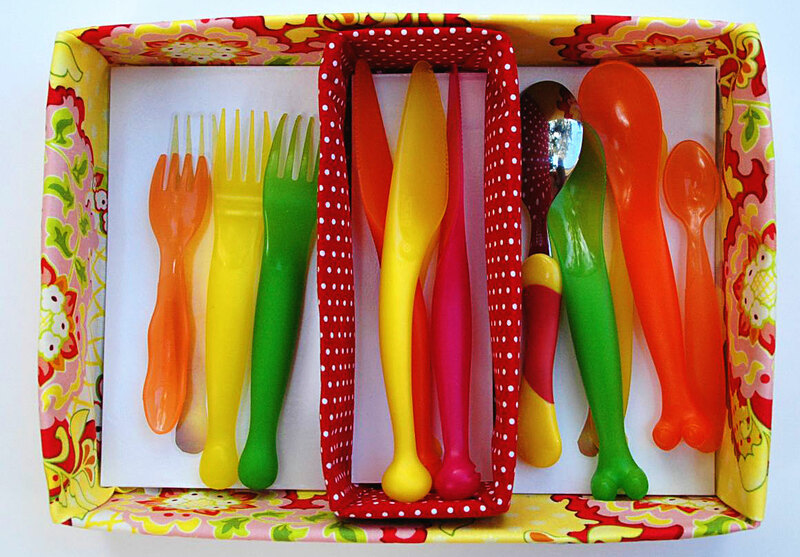 I am in dire need of durable kids cutlery and can never find any! love this! way cute and functional! super idea. on my to do list. thanks for this post! I knew you were going to say ikea, because everything amazing or fantastic or anything that I gotta have comes from ikea. One problem……No Ikea with in driving distance of where I live. Ugh. And you can’t order a lot off there website. Double Ugh. W.o.w! 1.99 for an 18 piece set is freaking amazing, now I just have to find somewhere else. I have been paying $2 for just a fork and spoon that after 5 times in the dishwasher fall apart. 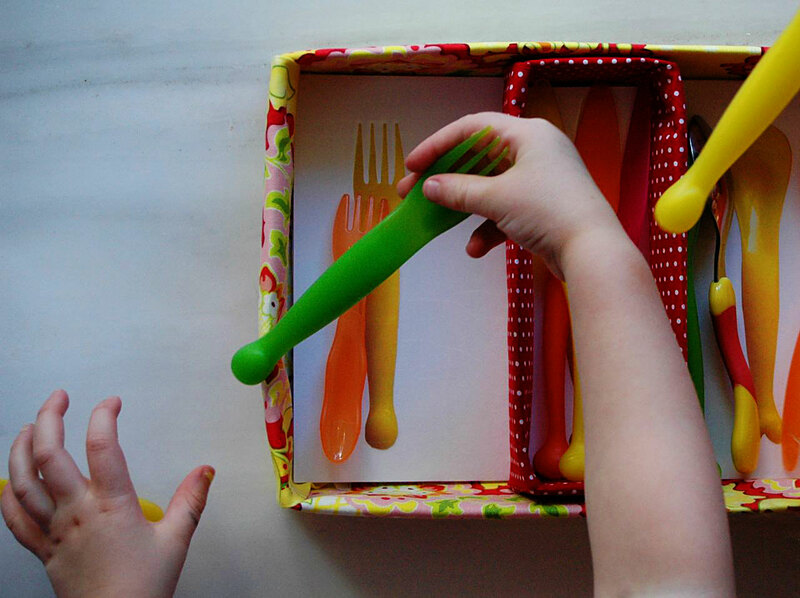 Thanks for sharing, it has opened me up to affordable kids cutlery. Tear tear, sniff sniff. Very very cool! I love that it fits IKEA kidware too. I love it! It’s super cute and it looks really functional too. When I used to teach preschool we put silhouettes of everything all around the room so the kids would know where things went and could put things away more independently. So it’s not only cute, but it’s so age-appropriate too! Really cute, and I love how easy it looks to make! 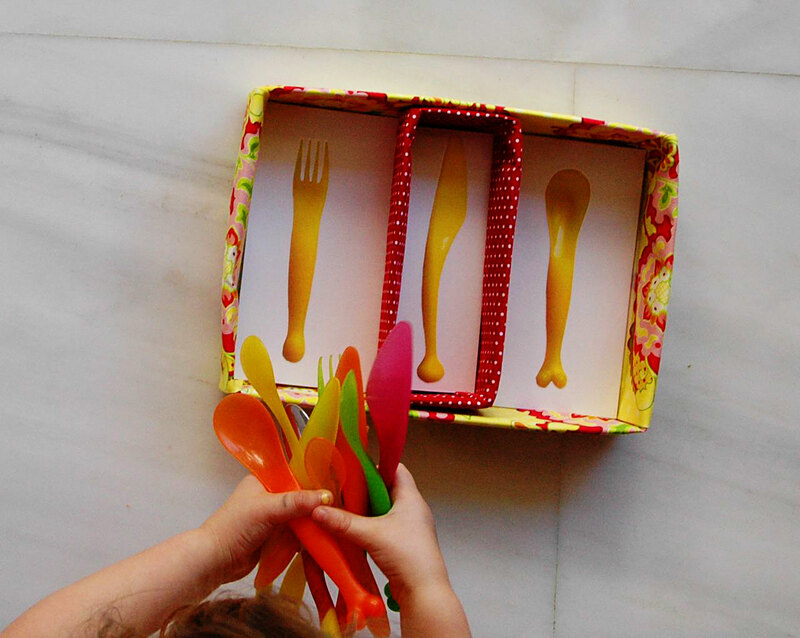 Mostly, I want to know what cutlery you got your munchkin that’s plastic but has knifes – I’ve been looking everywhere for toddler cutlery that has more than just a fork and a spoon! So cute!! My 2 year old’s favorite thing to do is to help me unload the dishwasher and it’s amazing how good she is organizing the utensil drawer. She would LOVE this!!! Cute AND organized. Two of my favorite things. You won my heart. :) Love the tutorial! This is adorable! I wish I had a freaking drawer to do this for! My tiny kitchen stinks! I love your blog! 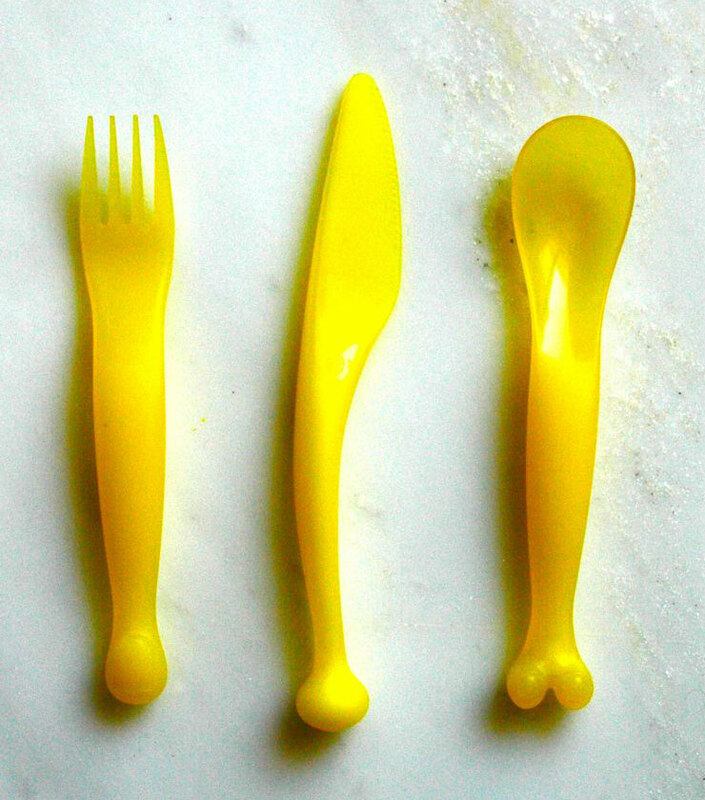 I have a set of plastic forks and spoons from the grocery store that we love… wish I could remember who made them. They are similar to other take-n-toss products and have animal shapes on the handles. We’ve had them for about 6 years and still goin’ strong! They came in a plastic cylinder by the paper plates. Good luck! So cute! I love that everything matches… matchy-matchy is the only way to go. Thanks for sharing! I am going to make one for my little guy. :) Love it!